Forming an important first class public meeting space on Promenade deck the main hall was and still is a major original feature of the Queen Mary. Initially the high art deco design of the floor followed the curves of the recessed ceiling panels. The original colors were two shades of green with cream accent strips. An inviting cluster of cream leather sofas and chairs with darker back panels sat on a custom designed carpet in the center of the area. "This important space which is about 90 ft. in length from the head of the stairway, provides access to the sheltered promenade through vestibules at the sides abreast the stairway". The stairway seem from the top and from the bottom of the first flight of stairs. "The walls are paneled in oaknut in vertical courses, with horizontal banding in chestnut, while the dado is carried out in elm burr (See photo - left). The doors and pillar casings are also in rich elm burr, ash burr being introduced in the feature pieces", (the same wall and floor treatment was carried down the staircase as far as R deck. 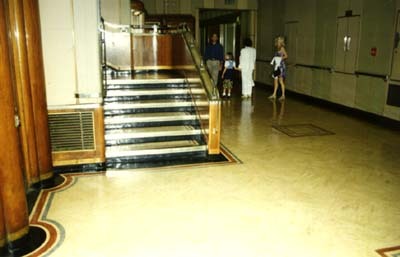 The pre-war oaknut wood wall panels with horizontal banding are still in place in the lobby of the main stairwell on M deck to this day,(1999)). "Colour and interest are, of course, provided by the contents and lighting of the shops and showcases. Looking aft, the focus of interest is the marble medallion plaque of Her Majesty Queen Mary, by Lady Hilton Young (Lady Kennett), set in a large panel of special walnut burr at the head of the stairway. Below the plaque is the standard presented to the vessel by Her Majesty. Two telephone kiosks are arranged abreast the main stairway, and these suitably screen the writing rooms at the sides of the central funnel hatch. The central feature at the forward end is, of course, the large shop, and further interest is given by a decorative glass niche with a large jardinière below for fresh flowers. Looking across the Hall from the Port side - (the doors leading to the sheltered promenade are opposite). An important feature of the decoration is a large plaster frieze in an ivory shade. This panel, 50ft. in length, has been executed by Mr. Maurice Lambert. Wide corridors at the sides of the shop lead to the lecture room, studio, childrens room and cocktail bar, the paneling being in beautiful maple burr with elm burr dado, further relieved by two decorative panels incorporating maps of the world in relief. The brilliant lighting forms an integral part of the scheme. Over the main stairway there is a large two-tier glass fitting; while in the soffits, concealed lighting is provided, and, in addition, there is a series of decorative circular fittings. The shops and showcases have been designed en suite [by Messrs. Waring and Gillow] with the hall, and form an integral part of the scheme. Besides the central shop there are two small shops at the sides, and all are admirably fitted. The silver-bronze shop fronts, fittings and showcases, it may be mentioned, have been provided by Messrs. George Parnall and Co., Ltd., of London. The material employed in their manufacture is that known as Delta 2 silver bronze, supplied by the Delta Metal, Co., Ltd., of London. each 32 ft. in length. They actually take the form of galleries, and provide access between the hall and lounge. Large decorative panels are arranged on the sides of the funnel casing, which constitute their inner boundary. These panels take the form of large serial maps of London, Washington, New York and Paris, together with a mechanical universal time map. The panels are surrounded by massive molded architraves. Ash burr, straight ash and pearwood are among the woods used for the beautiful writing tables and chairs. Each table is individually illuminated while the general lighting is provided by glass semi-dish fittings. Handsome carpets and curtains combine to make the rooms singularly appropriate to their function." 1936 - 1939  As a first class meeting place and shopping areas as described above. Lest the reader go away with the impression that life on the Queen Mary was entirely uneventful in her early years, we suggest you read Ronald Winters wonderful book entitled, "The Queen Mary, Her Early Years Recalled." In it, Mr. Winter, a maiden voyage electrical-engineering officer on the Queen Mary, vividly describes a late evening fistfight between two handsome, tuxedo clad Lotharios for that nights favors of a beautiful, elegantly dressed professional courtesan that took place in the main hall. The "lady" maintained her full neutrality, perhaps confident that she would earn her keep that evening with either one or the other. 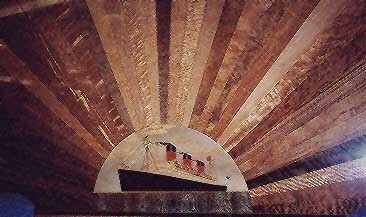 1940 - 1946- The Queen Mary was used as a troop transport. 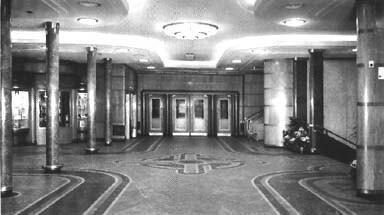 The main hall no longer sported shops, but was still a central point of circulation on Promenade Deck. Because of the heavy usage, the flooring would be replaced during the ship's postwar refit. Above right - the Austin Reed shop in use as an army office during the second world war, and left, the main Hall filled with soldiers during the ship's duties at this time as a troopship. again assumed commercial use. (The WH Smith Shop became a woolen goods store.) 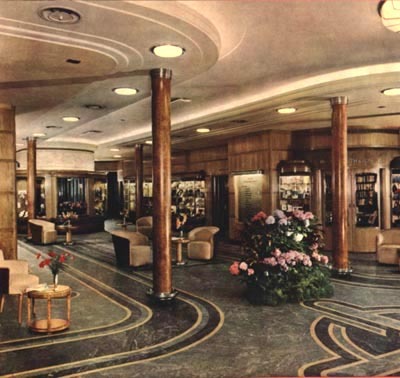 However, there was a reassignment of function in the forward adjacent areas that somewhat diminished the standard of luxury on the Queen Mary for first class passengers. The large pre-war playroom on the starboard side was moved into the smaller music studio space on the port side. (The original playroom area was apparently converted to offices.) And the pre-war lecture hall on the port side was converted into cabin space for retail merchant personnel. 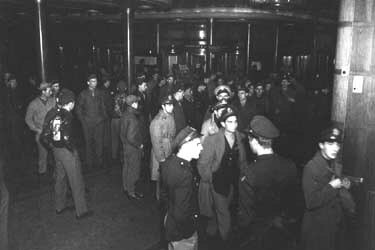 After years of heavy use as a troopship, the main hall was refit with a new, lighter (primarily cream colored), less deco/flamboyant linoleum flooring. The oaknut wall paneling was removed and replaced with a two-tone tan/gray leather hide wall covering that is stretched in vertical banded sections. Brighter lights were also installed and the recessed ceiling. The overall effect was no doubt brighter and more in keeping with the simpler tastes of the late 1940s. 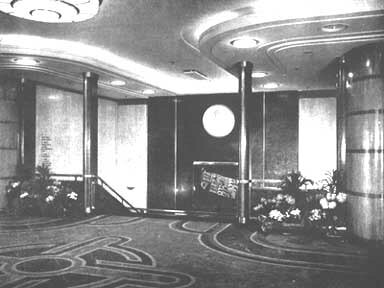 A very similar decorative scheme was found in the main hall aboard the Queen Marys new sailing mate, the first Queen Elizabeth. Left - The Main Hall in 1947, immediately after the refit. At the same time the port side writing room was fully enclosed to house a passenger ship to shore radio/telephone facility. The starboard side writing room was also partially enclosed. The floors and wall treatments in both were redecorated ensuite with the "updated" main hall. Etched glass panel was added at the ceiling level of both of these rooms. 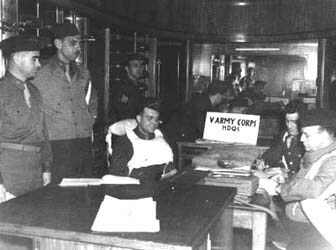 Those on the port side radio/telephone room illustrate the means of telecommunications through the ages, while those in the starboard writing room depict changing tools for writing. 1967- to present - with the purchase of the ship by the City of Long Beach, the focus of the main hall shifted from being meeting and greeting place for first class passengers to being a shopping center for walk on tourists. The term "Piccadilly Circus," the now low-end, busy area of London was formally adopted as the name for the facility. While the central part of the main hall itself was virtually untouched, the years took their toll on the area. The ceiling has been obviously patched in a number of areas after water damage, as have the hide wall coverings. The interiors of the display cases are more than ready for wood restoration and fluorescent lights give a grey cast where there was once a warm glow. The Main Hall in its pre-restoration condition. Note the art deco planter / light fixture in the foreground of this photo. It is the surviving one of a pair that were originally in the center of the first class dining room on "R" deck. Still the area retains a strong sense of its post war image. For example, the three small original shops have retained their essential size and décor through a bevy of lessees. But an assorted variety of other functions and shops have been crammed into every nook and cranny off the main hall. The only surviving first class writing room was gutted and turned into a ladies' latrine. 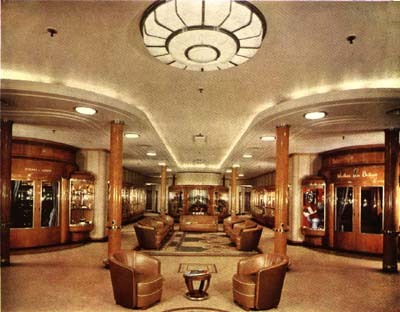 Its pendant, transformed into a passenger radio-telephone room after the war, is now a sea-shell souvenir shop that spills out onto the enclosed promenade deck. A glasswork shop now inhabits the library and postcards, tee shirts and refrigerator magnets are sold in one of Sir Winston Churchill's favorite rooms, the drawing room. 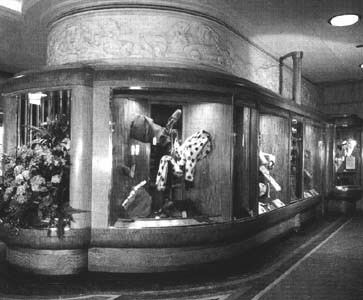 In the late 1980s the Disney Company acquired and installed the large marquetry panel (photo - right, courtesy of Tracy) with an image of the Queen Mary that is composed of samples of all the exotic woods that are found in the interior of the ship. 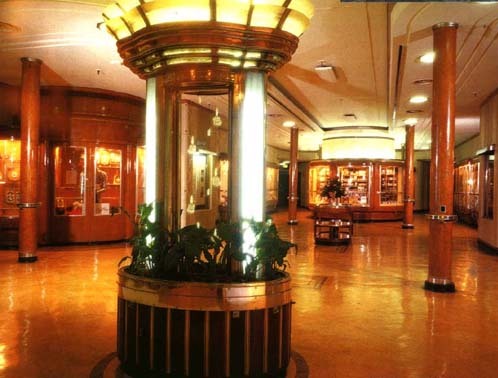 We understand that it once graced the corporate office of the Cunard White Star Line. 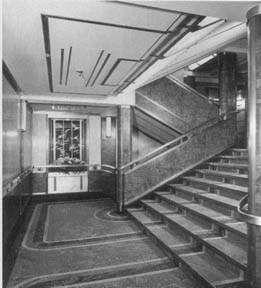 The panel was installed in front of the twin starboard side passenger elevators doors (currently not in use), unfortunately obscuring an original functional feature of the ship. The revolving wood and glass doors that were part of the vestibule system that protected the main hall from the weather were also removed at about this time. By the mid 1990s the postwar linoleum was reaching up towards 50 years of continuous use  at least ten beyond the planned life expectancy suggested by the manufacturer. For the safetys sake and presentability it was time for a replacement. Left - Restored furniture near the well known (now ex-) "Crown Jewels" Boutique. Right - General shot of flooring after renovation. The 1970's spot-lighting remains. To their credit the RMS Foundation decided to replace the floor with the same material as was placed there originally  traditional linseed and hemp based linoleum. The post-war pattern was chosen. While not as elegant as the original pre-war design, the decision was reasonable given the limited budget and the fact that the walls were covered in 1947 to match this color scheme. A layer of cement was laid on top of the existing flooring and the new covering was laid on top of this. An outside contractor, Marvin Jacques, who repaired the floor with patches in 1993, performed the work. Though he would have preferred to go down to the steel decking, he has done a first class job with the limited resources available to him. The work is excellent. An ex-crew member who used to clean the floor was on board recently, and he thought it was the original flooring! A number of main hall merchants made significant donations for this worthy floor restoration. The only sour note in the endeavor is the fact that this effort was also paid for in part by the auctioning of artifacts from the ship's archives. A restored area of the main Hall - the staircase leading to Sun Deck. 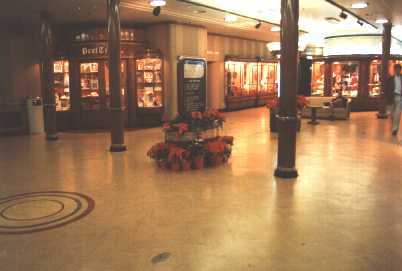 With the replacement of the floor, the RMS Foundation renamed the area the Main Hall and stopped the practice of employing the burlesque style live entertainment they once placed here. 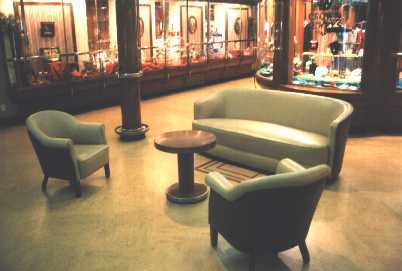 Ron Smith, the knowledgeable RMS attractions manager, located an original main hall sofa aboard the ship and had it recovered in a cream naugehyde. (Premium leather was beyond the budget.) He also gathered a few original (but not to this area) tub chairs and similarly had them recovered to created a simplified version of the once elegant seating area found in the center of the hall. The custom designed rug that anchored the seating area and that remained in place for the commercial life of the ship has not been found or replaced. Full restoration, of course, awaits the repairs of the walls, ceiling, and display cases. The original light fixtures also await appropriate relamping. But a very positive first step had been made here. In recent months the RMS Foundation has made changes in the tenancy and decoration in a number of the shops now found here. The intent appears to be to upgrade the appearance and caliber of the retail operations. But the basic retail strategy in place for the past 27 years remains virtually unchanged. The shops might just as well be in the "Queens Marketplace," in Long Beachs "Shoreline Village" or even in San Pedros "Ports of Call." An illustration of the layout and assignment of function to this area as we see it is found below. For articles on the history of the Drawing Room, Library, Music Studio, Childrens Playroom, and Writing Room(s) once found here and our views on how they might once again become recognizable elements in this shipboard scene, please see the articles from the "Lost Glories and Hidden Treasures of the Queen Mary" series that are listed below. The Cargo Holds  the proposed location for the "Stores of the Queen"
Possible future retail configuration on Promenade Deck - click on map for more detail.